Technology Products - SCI Technology, Inc. Wherever safety is the top priority, SCI Technology’s Gas Environment Monitoring System (GEMS) stands on high alert. Designed and developed with the most stringent safety standards in mind, GEMS is highly customizable for monitoring gas presence in extreme industrial environments, including inside and outside containment in commercial nuclear power plants. 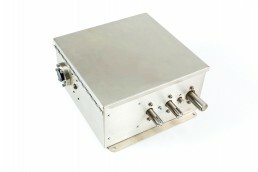 Fully configurable to customer specifications, GEMS has broad capabilities to continuously monitor hydrogen, oxygen and steam levels, plus environmental information such as temperature and pressure, without the need for sampling systems, pumps, heat tracing or other unreliable and expensive support equipment. A graphical interface makes readouts easy to understand, keeping your plant running smoothly and safely at all times. A femtosecond laser pulse lasts one quadrillionth of a standard second, which is more than enough time for SCI to work with. Using advanced solid state methods with no moving parts to analyze femtosecond laser pulses, our engineers are able to measure several key datapoints embedded within the signal. That information allows us to diagnose the laser in real time, ensuring that a variety of applications can proceed without a hitch. Imagine a surgical laser safeguarded by continuously updating diagnostic data. Or a femtosecond laser that performs intricate micro-machining operations—but shuts off automatically the moment its performance metrics fall below predetermined parameters. With the help of SCI’s New Technology team, these scenarios could soon become reality.